It's a beautiful day in the neighborhood. Florida's thunderstorms, however, are sneaky. They're scattered; they're spotty; they're not terribly predictable. And Florida's dogs, by and large, have a terrible fear of thunder, lightening and fireworks. Our little Oliver, a 10 lb. Papillon is fortunate to have only a mild version of this phobia. His dear departed Xena, a Retriever mix, would head for the highest table she could get onto whenever the noise started. We suspect she felt the vibrations in the ground. 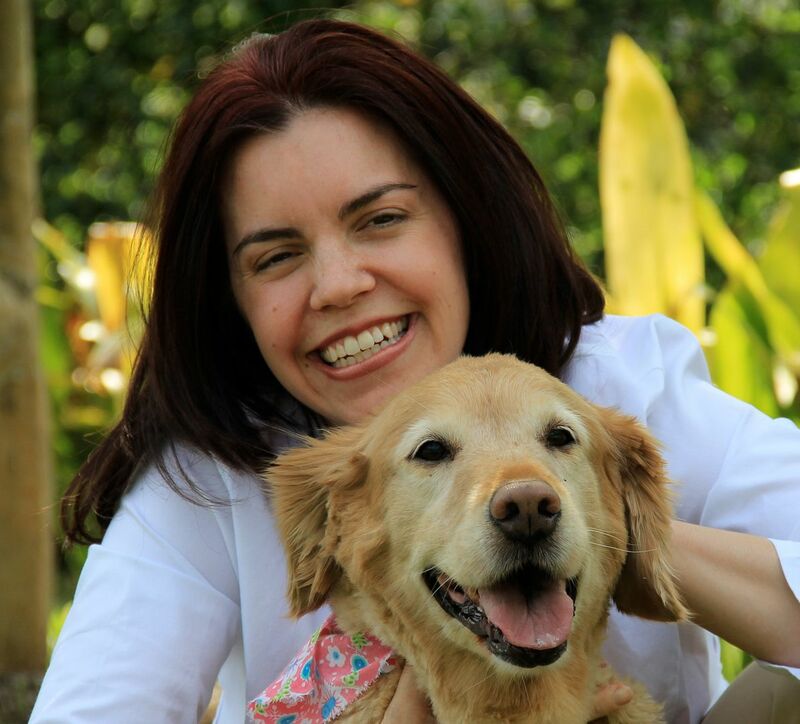 But no matter what your dog's particular reaction, we have found a healthy, non-toxic way to reduce the fearful reaction with Oliver. We'll share it here today. The Thundershirt works much like swaddling a baby. For those of you not familiar with this term, it's similar to a snug wrap that, by nature of its tight fit, has a calming effect thereby allowing the dog to relax a bit. The day may start sunny and pleasant, but as mid-afternoon arrives, Oliver seems to know that the storms will also. He hangs closer to me, checks the windows often, and will begin to snuggle up just about the time the sun disappears or the wind kicks up. That's my signal to put on his shirt. There's just one thing he always does first. He checks on Tanner. It's sort of cute, this brotherly love business. Oliver watches through the door as Tanner swims, even as I've already put his Thundershirt on in preparation for the coming storm. Out of the Pool, You Nut! As Tanner finishes his swim, Oliver heads outside to gather his brother into the house. He barks at Tanner in the pool as if to say "Get out you nut! It's going to storm." Back in the house, Oliver finds solace in a bed near my desk, and as the thunder begins and rain pours down, I can't help but notice that there is a subtle shift in his behavior. When he used to hop onto my lap and shake, he now will lay up to 10 feet away from me, rarely raising his head to acknowledge more than the loudest of bolts. It has become clear that Thundershirt's effect is successfully helping Oliver to calm himself. He's more of a 'take charge' guy now, even while wearing the outfit that my family sometimes teases (lovingly, of course) about. Oliver's Thundershirt is the classic, original heather gray model. Now the company has gathered their fashion sense and decided to begin offering the shirt in cute styles for the more fashion savvy. Whatever your style or size, Thundershirt works. It's not a night and day difference, but it does have an affect on Oliver's behavior. No more lap snuggles during storms. Like right now; he's napping peacefully in his bed during a loud and long thunderstorm. Can you hear him snoring? Okay, so let's see if there are some other pups out there who need a Thundershirt. I've got a mission to give away 3 of these soothing, classic gray Thundershirts to help your pooch wear a happier demeanor during rainy season. Entries all come back to comments. No matter what the form of entry, you must still leave a comment here to register that entry for the drawing. Tell us about your dog's anxieties--storms? separation? travel? crating? barking? Thundershirt has been shown to help many types of anxious behavior. "Like" All Things Dog Blog and Thundershirt on Facebook. Be sure to leave a comment and tell them All Things Dog Blog sent you! Leave a comment telling me you've "Liked" us. For 4 entries to this drawing, print a photo of your dog, or a photo from this post. Add some words like "I Like Thundershirt and All Things Dog Blog" or "Thank You Thundershirt and All Things Dog Blog" to the sign and post it at both of our Facebook pages. 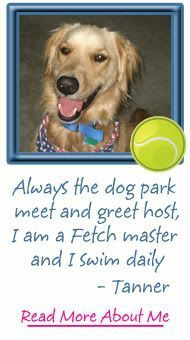 Don't forget to tell us your dog's name, and follow up with a comment here to register your entry. 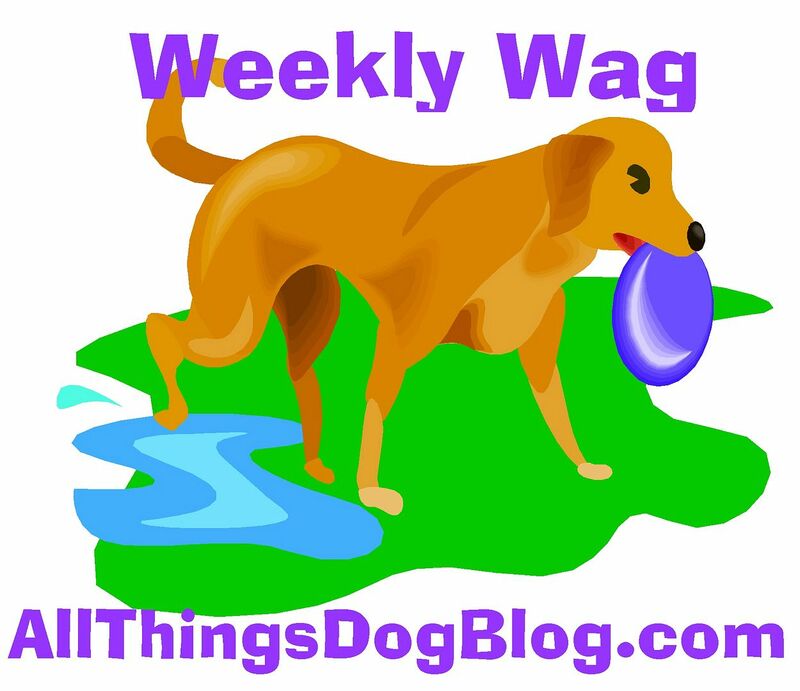 Subscribing to All Things Dog Blog gets you another entry, whether by email or RSS. Leave a comment telling me you're a subscriber. Follow @AllThingsDog and @Thundershirt on Twitter. Be sure to comment about this! Tweet this great giveaway: "Thanks @AllThingsDog 4 hooking us up to your @Thundershirt Giveaway", and don't forget to comment that you've completed this entry. Hit the Tweet/Retweet button at the top of this post for another entry. Surprise: You can even watch a YouTube video about Thundershirt and comment there, as long as you let me know here. Want to know more? Visit the Training Center or the How it Works page. Are you considering ordering your own Thundershirt? Keep in mind that they offer a 45 day money back guarantee if the product does not help your dog. What have you got to lose? You can order through their website or many other online locations such as Amazon. You'll also find Thundershirt at many stores like Pet Supermarket; that's how popular this great product has become, with its veterinarian backing and tons of testimonials. Oliver adds himself to that list! Entries may be made once daily for each method. Entries close at 5 PM, Thursday, July 28, 2011. Winners will be selected by Random.org. The winners will be announced on Friday afternoon, July 29th. 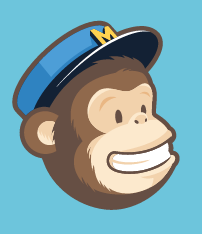 A method of contact is required to win: Twitter handle, email, blog URL. Good luck to everyone who enters. Be sure to check back on Friday afternoon, July 29th, to see who the winners are. Happy tails! Full disclaimer: Thundershirt provided their product for Oliver to try and us to review on All Things Dog Blog. We have not been paid to give our opinion and the experiences we shared are true and actual. Our dog, Sophie seems to have somewhat gotten over her fear of thunder...But then we started going to the lake on the weekends. People there enjoy lighting off fireworks and firecrackers. Sophie has never been more petrified! Poor little girl - she runs and hides under the nearest table she can find. She gets so scared that she won't even take a peanut butter treat. I'm sure that the Thundershirt would help her through this. 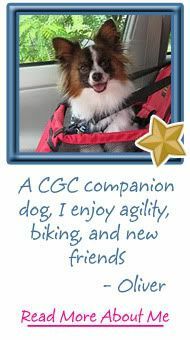 I "Like" All Things Dog Blog and Thundershirt on Facebook & let them know All Things Dog Blog sent me! I subscribe to All Things Dog Blog via RSS. I posted a photo of Sophie saying "I like Thundershirt and All Things Dog Blog" on both Facebook pages. I follow @AllThingsDog and @Thundershirt on Twitter as svberges. I follow all things dog blog and thundershirt on twitter. Torrey has anxiety around crowds, and with loud noises. I like All Things Dog Blog and Thundershirt on Facebook. Kouga is afraid of Thunderstorms, other than that he is a real calm dog. 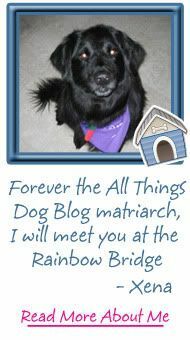 I Like" All Things Dog Blog and Thundershirt on Facebook as Kelly Ann T.
I subscribe to All Things Dog Blog thru email. My pup Lola has really bad anxiety when we leave the house and occasionally when we travel. We will not crate her and put her under a plane so whenever we made our 1500 mile journey it makes for a long 2 days. We'd love to try anything to help calm her anxieties. I have a little chihuahua who is very skittish with loud noises and tends to hide or come to me wanting to be held. I would love to try this out with him, Ihate whe he is scared. I subscribe to All Things Dog Blog! I posted a picture on Thundershirt and All Things Dog Blog facebook pages. Shiloh may be a big dog, but he makes himself as small as he can get when there's thunder. It's amazing how a big dog can make himself look so small! i like you and thundershirt on fb!! i commented on the thundershirt youtube video! I have two Chihuahuas. Juju is afraid of thunderstorms and Elly has major seperation anxiety. I like All Things Dog Blog and Thundershirt on Facebook. I also subscribe to All Things Dog Blog via email. Sarah's a puppy mill survivor/rescue so thunderstorms are just one of her fears, but definitely one of the worst. Oh, I could type all day, but you get the idea! FINALLY uploaded the correct photo with our "sign" on Thunder Shirt's Facebook page (tagged All Things Dog Blog)! I tweeted the above text! I watched the you tube video and commented there. I would love to win this for Kouga who suffers from anxiety during thunderstorms. Was redirected to another site so I'm not sure it went through?? I don't know why Kouga is afraid of storms but fireworks and other noises don't bother him. Man, let me tell you about anxiety with my dogs. We have six, and I own three. Daisy and Scruffy have separation anxiety, but Daisy the most. She once ripped up carpet under the door at my cousin's mom's house in Oklahoma because we left to go out and I had not begun to use crates or learned about the benefits yet. I was mortified and I am so glad I didn't have to pay to recarpet the whole upstairs because of that gigantic chunk missing. Scruffy does not like thunderstorms at all. He mostly sleeps under the bed which I try and get him to not do anymore because he electrocuted himself once on a lamp cord (another story). If there are thunderstorms he will get into bed with me and lay on top of me and paw at my face saying "Mommy, I'm scared please love on me." I will pet him and give him kisses and then a few minutes later he will get next to me or find a spot somewhere on the TWIN bed, by the way, and go to sleep. Bambi has an anxiety about other people. I was really depressed (and learned to be honest no matter what or how people react now) when I got him. I got Scruffy 300 miles away on the 3 month anniversary of my Barkley's death (who had to be put down 5 days before Christmas) and 10 days later my mom saw Chihuahuas being sold in the Walmart parking lot so that's how I ended up with Bambi. I had previously gotten Daisy in July and Barkley died in December. Anyway, I was really depressed and didn't leave the house except for high school in 2008 and it's 2011 and only now am I starting to feel better and get out of my hermit phase. So I don't take my dogs to Petsmart or Petco or dog parks because they will get fleas if they go into those stores or earmites. I have had it happen before and I have so much anxiety about fleas and once I get them, my hair literally falls out because of the stress. So Bambi is not social, will continually bark at people that come into the house, not only because my exstepsister smells like a vet clinic, but because he thinks he is protecting me. All I can do is tell him "no" and hold him or stick him in the same room with us so he can get used to new people and it is a very long process. Sorry this comment is so long, but you know dog people, once they start, it's hard to stop! I "Like" All Things Dog Blog and Thundershirt on Facebook. 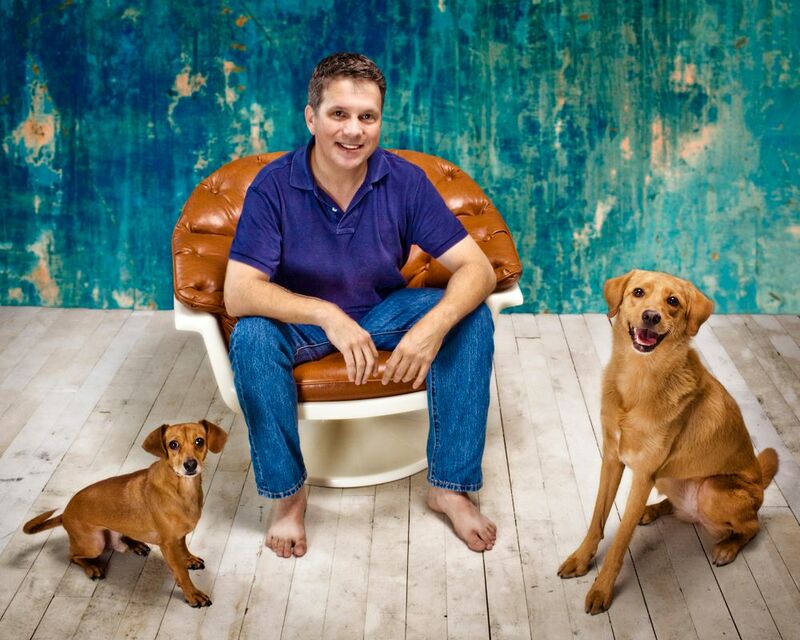 I Subscribe to All Things Dog Blog via GFC. I Follow @AllThingsDog and @Thundershirt on Twitter. I tweeted the "thank you." I left a comment on this YouTube video and they really need to change the title! My oldest dog wasnt afraid til last year, the vet said it was probably an increased sensitivity to sound as he entered his geriatric years. My poor old puppy, he needs a thunder shirt. My dog rocky is a little frightened of thunderstorms but doesn't panic. i follow All things dog and thundershirt on Twitter. 7/24 my dog has separation anxiety and i think that this thundershirt would really help. Kouga only shows anxiety during thunderstorms. Even when I take him in new situations he is thrilled and happy to go. Maybe the Thundershirt will work for fireworks too. Thunder and fireworks are Shiloh's biggest fears, and the neighbors are still doing fireworks. Kouga only seems to be afraid of thunderstorms. #1 I posted a photo of Kouga to All Things Dog blog and Thundershirt FB pages. #2 I posted a photo of Kouga to All Things Dog blog and Thundershirt FB pages. #3 I posted a photo of Kouga to All Things Dog blog and Thundershirt FB pages. #4 I posted a photo of Kouga to All Things Dog blog and Thundershirt FB pages. There are so many dogs who are afraid of Thunderstorms just like Kouga. We liked both FB pages. Mack is frightened by loud noises, which then makes her bark incessantly. Just subscribed to your RSS feed. I'm crossing my fingers hoping to win a Thundershirt for Kouga who hates storms.